After the success of last week's pickled carrots post, I thought it would be fun to talk about celery. 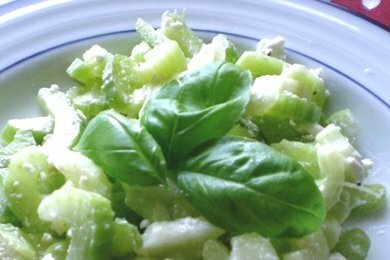 Luckily enough, I have a friend who as a fabulous celery salad recipe. Andrea writes Andrea's Wellness Notes and she is an inspiration. I have struggled at times with not making me enough of a priority. I have realized that to be the best wife, mother to my two boys - a teenager and a toddler, friend, and employee, I must put myself and my health first. A while back, my mother-in-law gave me six, yes six, bunches of celery. Initially, I wasn't quite sure what to do with them. I used some in a stir fry, put some in a salad, and ate some for a snack. Unfortunately, my family isn't the biggest fan of celery. They eat it, but they don't love it. What's more, they prefer it in small doses. So there I was with five bunches left, and I thought: What should I do with all the celery? So I thought, why not make a celery-only salad? I know, not the obvious choice, especially in light of the fact that there aren't a lot of celery fans around here. But, here is what I was thinking (yes, I was actually thinking!). I thought that celery in my salads wasn't very popular with the family because the dressing didn't go very well with the celery. I usually make a vinaigrette with balsamic vinegar and Dijon mustard, and I don't think these flavors go very well with celery (but the vinaigrette goes great with the rest of a mixed salad). I ended up making a lot of salad (I had resigned myself to eating it for the next days for lunch and dinner by myself in case they didn't like it!) and used all of the remaining five bunches. Do you like celery? What's your favorite way of eating it? Nice idea! I love making celery soup. Just cut up the celery and cook in water or vegetable broth. Add a bit of butter or olive oil once the celery is tender, sea salt and fresh pepper. Serve with strips of toasted, thin whole wheat bread. So low cal and delicious. Ha, this post comes in just in time as I'm debating what to do with some celery in my fridge right now. Although, no matter how much I cook and eat celery in a variety of ways, nothing beats Ants on a Log in my book. Celery, peanut butter and raisins - how can you go wrong! I often use celery in soups, but instead of chopping it I cut into long thin strips using a vegetable peeler. I'm excited to try the same thing with this salad! The translucent strips are very pretty, and maybe a bit more appetizing for kids? Made this for dinner tonight. It was a great hit! I like celery with pimento cheese packed into it. Or just plain. In stir fry. In chicken soup. And let's not forget Waldorf Salad! I just like celery. I buy the bulk celery that still has the leaves on, then I dehydrate the leaves and use them as seasoning instead of buying the high priced celery flakes. I would love to make this salad at some point~ I think spinach, celery, brussel sprouts, and broccoli are some of the most yummy veggies, as long as they're fresh and well made! i just tried this last night! i paired it with a super easy chicken recipe. both were so great i had to blog about them!